Mirror's Edge Catalyst, new version of the action game in first person from Electronic Arts, promises much parkour within the Xbox One and PS4. The release date of the game is scheduled for May 24, 2016. Launched in 2008, Mirror's Edge brought new level of engagement and innovation to the FPS genre and set aside the rampant exchange of shot to focus on speed and parkour in buildings of a fictional city. Faith in control of the heroin, the goal is to jump on buildings and offices to try to unravel a murder plot. After years since the launch for PlayStation 3, Xbox 360, PC and mobile, Mirror's Edge return to the world of games soon on the most current consoles. In 2013, during E3, Electronic Arts revealed that DICE was working on a new Mirror's Edge game. With behind the scenes trailer and arts, the game was announced at the time, which made many believe it is a sequel to the 2008 title. A while later, they revealed that the new Mirror's Edge would be a way to reboot the first game. Faith, the heroine of the title, returns with an updated look and, it seems, unpublished skills. Since the announcement, both Electronic Arts and DICE have commented that the new game is more ambitious and "kick to the franchise that Mirror's Edge deserves to be." That left excited fans, but new information on the game were revealed only in the following year's E3. In 2014, they released the title, Mirror's Edge Catalyst , and also details of the development in a video shown at the event. It is possible to have a clearer idea of the changes in the main character, as well as a taste of a version of the game. Catalyst will have a similar gameplay to the original game, because it focuses on parkour and unarmed combat. DICE the developers have gone further and, it seems, Faith can not use firearms. Thus, the gameplay becomes a bit more challenging. Another revelation is that the new game brings an entire city for the player to explore. Instead of stages with own scenarios, the gamer can walk by a huge place and thus complete missions any way you want. According to the producers of the title, it will help the players to feel the freedom that Faith has to run through the city rooftops, and choosing directions as you go. A sample of the new features can be seen in the video below, which was exhibited at Gamescom this year. Catalyst another element that should draw the attention of players is the multiplayer mode. Contrary to what many expected, the game does not allow gamers are in matches or races in the scene. In Mirror's Edge Catalyst, the multiplayer is used asynchronous. In other words, they leave small marks on the gameplay and when players access the game, the marks can view and respond to them. A good example of this is that the player can find a sign board with time made by a friend to travel the city. So it's possible to beat his record without the need for him to be online. Little is known about the history of Mirror's Edge Catalyst. The dots show revealed that the game will actually have a different plot of sight in the original game. Now, the story shows how Faith became the person everyone knows. According to Electronic Arts, Catalyst will have a much greater focus on plot than the previous title. Faith stretches with a child and being held were seen in a game trailer released at E3 in 2015. In addition, securities, corporations dominating the city and rebel group, the Runners, appear in the video. 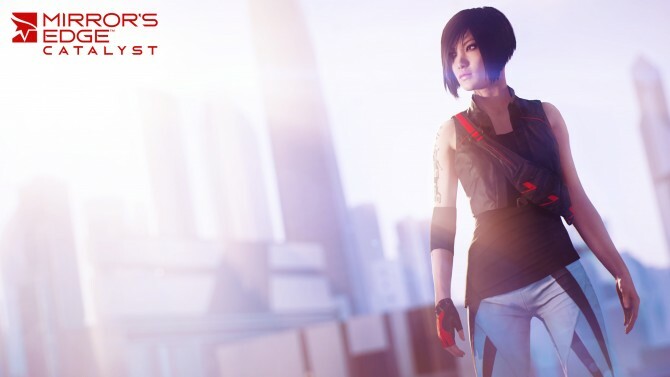 The game promises exactly what fans of Mirror's Edge asked for years: action, with improvements in gameplay from the previous game, the more scenarios and more exciting story. The Mirror's Edge Catalyst release date was scheduled for February, but was postponed and now it will hit stores (physical and digital, as Live, PSN and Steam) on May 24, 2016. The delay gives more time for the game to be refined and thus the developer can deliver a unique experience for players. The title will be released only for the current generation of consoles (PS4 and Xbox One) and PC. However, the minimum requirements have not been revealed so far. But it may be disclosed in a closer to launch day.